Chateau Mont Thabor is owned and managed by Daniel Stehlin today. Daniel Stehlin owns more than Mont Thabor. He is also famous for possessing one of the best mustaches in the Southern Rhone Valley! It would make Hercule Poirot jealous! The creation of Mont Thabor is much older than his mustache, as the property dates back to the late 1800’s, when it was purchased by the Stehelin family. The estate took its name from Don Prenety, who was inspired by the Illumines of Avignon in the early 1800’s. The Illumines found the idea for the name from mountains located in Galilee, Israel. Prior to becoming a winery, Mont Thabor was used as a combination of a mystic retreat and a hotel. The modern era at Chateau Mont Thabor starts with the 2000 vintage. Mont Thabor has 4 hectares of vines in Chateauneuf du Pape on a terroir of mostly rocks and stones with some red clay in the soil. The vines are planted in the Croix de Bois and Pied Redon lieux-dits. 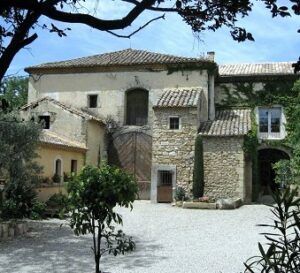 Chateau Mont Thabor produces one red Chateauneuf du Pape wine. Chateau Mont Thabor Chateauneuf du Pape is made from a blend of 80% Grenache, 15% Syrah and close to 2.5% Mourvedre and 2.5% Cinsault. The Grenache vines are old at close to 75 years of age. The grapes are not destemmed. Vinification takes place in traditional concrete tanks. Malolactic fermentation takes place in traditional, square, concrete vats. The wine of Mont Thabor is aged in a combination of 70% used and 30% new French oak barrels along with cement vats. Not much wine is made here. The production is on average close to 400 cases per year. Chateau Mont Thabor can be enjoyed on the young side. Young vintages can be popped and poured, or decanted for about 1 hour, give or take. This allows the wine to soften and open its perfume. Older vintages might need very little decanting, just enough to remove the sediment. Chateau Mont Thabor is usually better with 3-4 years of bottle age. Of course that can vary slightly, depending on the vintage. In the best vintages the wine should be consumed within 3-12 years after the vintage. Mont Thabor is best served at 15.5 degrees Celsius, 60 degrees Fahrenheit. The cool, almost cellar temperature gives the wine more freshness and lift. Chateau Mont Thabor is best served with all types of classic meat dishes, veal, pork, beef, lamb, duck, game, roast chicken, roasted, braised, stewed dishes, sausage, grilled meats, barbecue and cassoulet. Chateau Mont Thabor is also good with Asian dishes, hearty fish courses like tuna, mushrooms pasta, eggplant and tomatoes. The white wine of Chateau Mont Thabor is best served with a myriad of different seafood dishes, shellfish, crab, lobster, sushi, sashimi, chicken, pork and veal, as well as Asian cuisine. Chateau Mont Thabor also owns 6 hectares of vines in the Cotes du Rhone appellation. In the Cotes du Rhone, Chateau Mont Thabor produces both red and white wines. The red wine is a blend of Syrah and Grenache. Medium bodied, soft and silky, this elegant, fresh wine serves up juicy, fresh kirsch and floral characteristics with little effort. The wine was made from blending 80% Grenache, 10% Syrah, 5% Cinsault and 5% Mourvedre. Medium bodied, forward, open, red berry filled, spicy wine that will offer fine, early drinking pleasure with a fresh floral character. Drink this tasty wine young, as it is not going to make old bones. The wine was made from a blend of 80% Grenache, 10% Syrah, 5% Cinsault and 5% Mourvedre. Forward, early drinking style, with freshness to the red fruits and a spicy core of fruit in an easy to like finish. Sweet cherry and garrigue filled the air. The wine offers ample richness, intensity and lush textures and ample freshness. Produced from a blend of 80% Grenache, 10% Syrah, 5% Mourvedre and 5% Cinsault, the wine reached 15.9% alcohol. Candied red berries, medium bodied and forward, this lighter styled wine should be best young. Medium/full bodied, dark red in color, plushly textured, with a ripe, sweet, black raspberry, thyme, pepper and garrigue personality. There is freshness and a blast of kirsch in the finish. Soft, elegant, fresh, medium bodied wine that is ready to go. The sweet cherry notes are ripe, and you find nuances of thyme and assorted herbs to round things out. This is drinking at close to peak, so if you have some, it is best to pop those corks. Ready to go, the wine is medium/full bodied, with loads of sweet, ripe, juicy red fruit, pepper and herbs, coupled with supple textures and fresh, red berries in the finish.